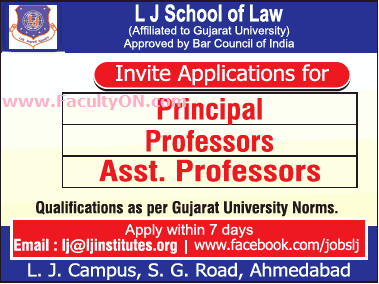 L J School of Law, Ahmedabad has advertised in THE TIMES OF INDIA newspaper for recruitment of Teaching Faculty- Professor / Assistant Professor / Principal jobs vacancies. Interested and eligible job aspirants are requested to apply within 07 days from 15th August 2018. Check out further more details below. About College: The Lok Jagruti Kendra's idea behind starting the school of Law is not just to produce degree holders in law but to produce Lawyers who would practice in courts of law. In view of globalized scenario, the institute's trust areas would be cyber crime, forensic law, legal communications, skill acquisitions in interpreting laws. Besides full-time faculty, the institute has plans for large scale involvement of eminent lawyers practicing in local courts, high courts and supreme court. The institute also proposes to introduce a pedagogical innovation -"Lawyer on wheels"- under which the students will go to interior villages for creating legal awareness as well for providing legal help to the socially and economically backward classes. The institute will provide a unique learning experience to the students.